In the early 1990s, writer Alan Grant and artist Simon Bisley turned a relatively obscure DC comics character into an over-the-top parody of the violent depictions of Wolverine, the Punisher and other heroes of the previous decade. Naturally, fans ate it up and soon DC had a new star in this psychopathic, profane mass-murdering space biker who looked like a cross between James O'Barr's Crow and Charles Manson. Lobo is a Bounty Hunter and contract killer wanted across the universe. His real name is unpronounceable, and he has no set base of operations, preferring to remain mobile. Lobo has immense superhuman strength, is virtually invulnerable, has increased agility, speed and stamina, and is able to recover from almost any wound or injury. Lobo is the best tracker in the universe, and wields a huge variety of guns and weapons, including his favorite: a long, heavy chain with a sharp hook on the end. Despite his appearance in two episodes of Superman: The Animated Series and an episode of Justice League, fans of Mattel's JLU and 6" DC figures were repeatedly told that DC considered the character "too mature" for toys (though he was given a DC Direct action figure years ago). 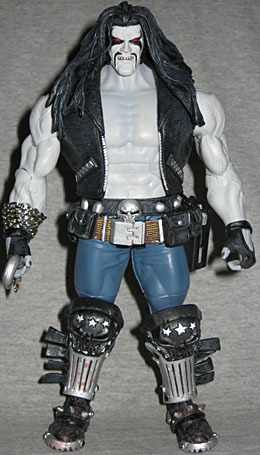 Eventually a compromise was reached: Mattel would make a Lobo figure, but release him only as a San Diego Comic Con exclusive. Lobo arrives in a huge custom blister package. The front looks much like the standard DCUC packaging, with the angled blister and six pieces of art on an orange background behind the figure. He even gets the logo at the top and his name across the bottom. The back shows a computer monitor on some space station (or perhaps the JLA satellite) warning of Lobo's approach - and to stay away from him. Unlike the standard packaging, Lobo's blister has the advantage of being resealable. Clamshell-style tabs line the side and top of the blister, and the bottom is held shut by a clear round sticker: that means you can take Lobo out, play with him, then put him back in the blister for storage. How's that for packaging! 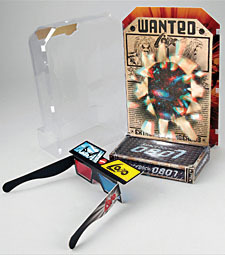 Inside is not only your Lobo figure, but a cardboard display stand complete with 3D glasses so you can be just like Lobo! The backdrop is a wanted poster that Lobo has seemingly burst through, revealing a galactic scene behind. The stars and broken bits of poster are all in 3D, which is why there's a pair of glasses attached to the front of the base. The base, by the way, is a diamond plate section of flooring from Space Dock 0807 - and if you don't get that joke, type the numbers in a calculator and then turn it upside down. 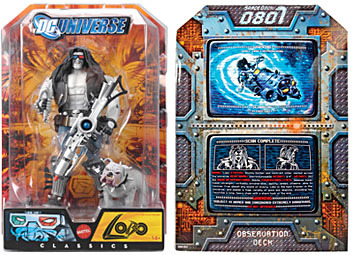 Actually, Lobo comes with two pairs of 3D glasses: the one attached to the figure, and a second, un-folded set that Mattel just handed out with the toy. Why? Because the ones packed inside the blister were either printed or assembled backwards, which meant the lenses were switched. Remember, red goes over your left eye, blue goes over your right. Even funnier, then, that inside the flap used to cover the lenses is a quote attributed to the Main Man himself: "Th' specs better work - or some marketin' geek's gonna need a new fraggin' set o' peepers!" Oops. Sorry for your loss, marketing geek. Anyway, now that you've got your (proper) glasses, the next steps are to start dressing like In a Metal Mood-era Pat Boone and plotting to kill everyone on your homeworld. It should be no surprise to anyone that the Four Horsemen's work on Lobo is superb. They've sculpted Lobo in his classic look as a white-skinned death metal biker armed with laser rifles, hooks and chains. The head sculpt reminds me of McFarlane's Rob Zombie figure from years ago. The texture on the leather vest is particularly well executed. While DC Universe Classics has had some issues with their paint applications, Lobo came out great (well, mine did, at least). The paint work appears to be a bit better than what you see on your average DCU figure, with some excellent drybrushing on the leather vest and hair. The paint on the belt, especially the pouches and the gold portions, are also quite well done, as is the wash on his torso. The wash isn't quite as nice around his shoulders and biceps, but it's also not as noticeable. Overall, with the exception of the blotchy "blood flecks" on his shin-guards, I'd say the paint work on Lobo is as good as any specialty market figure from NECA or McFarlane. Even his teeth look realistically filthy. 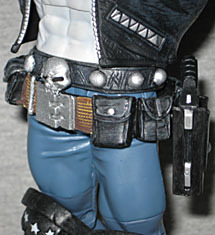 Lobo features the standard DCU articulation: a balljointed neck, balljointed shoulders, hinges at the knees, elbows, ankles and abdomen, and swivels as the biceps, wrists, thighs, boots, and waist. His head's range of motion is severely limited by his long hair, and Mattel still can't quite seem to figure out how to consistently provide the ankle joints enough room for the side-to-side motion they're (presumably) designed for (I'm not even sure Lobo has those joints). 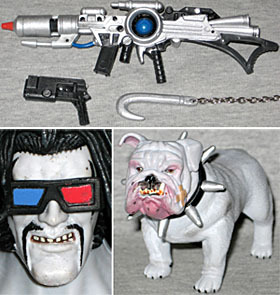 Lobo's accessories include a huge laser rifle, a blaster pistol, a pair of 3D glasses that fit on his head (and can be placed on his forehead) and his signature hook, which is attached to a loop in his arm via a real metal chain. The chain can be wrapped around the arm and will stay there pretty well, and all the weapons fit easily in his hands. The blaster can be holstered on Lobo's hip. But wait! There's more! Lobo also comes with Dawg, his pet bulldog. Dawg is articulated at the neck, and while he feels a little like one of those Schleich toys you can get at Target or Toys Я Us these days, he's a worthy accessory. ...but now we come to Lobo's greatest problem: he's frickin' huge. Fan estimates of Lobo's height range from 7 to 8½ feet (the back of the packaging, meanwhile, lists him at 6'4"), but if you look at most comic depictions it's clear that while Lobo is big, he's definitely not anywhere near nine feet tall. This figure stands 8.5" tall, which in the 1/12th scale of DCU makes him way too big next to a regular figure. This is because Lobo was made using the Despero BAF body (and even shares his weapons). For Despero, this size makes sense - he's supposed to be enormous, at least in modern depictions. 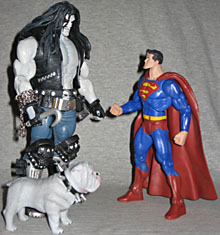 But Lobo is greatly out of scale with the rest of DCSH/DCUC. It's incongruous enough that I can't bring myself to display him with the other figures. And so, I'm left with mixed feelings about the DCU Lobo exclusive. As an action figure of the Lobo character, it's superb. 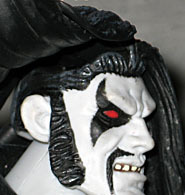 But if you really wanted a Lobo in scale with your other DCUC figures, you're going to be disappointed.